Oh yes nice chicken delicacy & I love P #QueenP…Hi #Queens! Guys, kalma. Ang daming endorsement ni pia. May fabric softener, may conditioner , may bango, may manok. Nung nanalo si megan young hindi ganyan karami endorsements nya. Its been a year since her reign and yes i think pia is still relevant. Ano naman ba akala natin , na ganun kabilis magpenetrate ng US mentertainment market? Susme ang dami ngang goodlooking locals na struggling to even be casted, so wag tayo masyado umasa agad agad . Grabe naman expectations nyo kay pia. 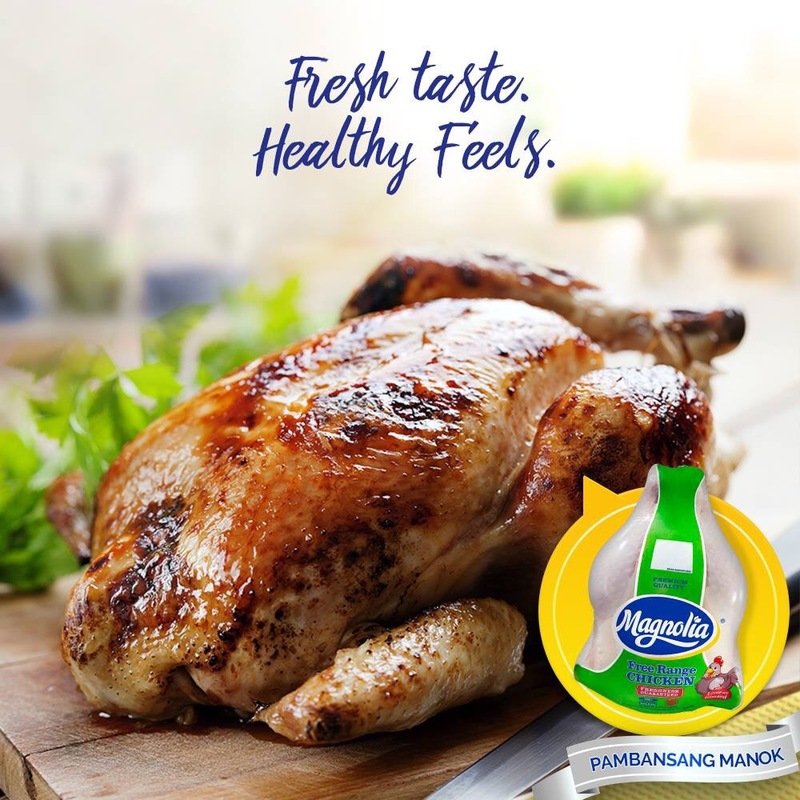 Agree that the Magnolia chicken (or ice cream or milk) brand is one of the more reputable brands in the Philippines and it is owned by San Miguel Corporation, one of the biggest , if not the biggest conglomerate in the country. And their product is really of good quality. 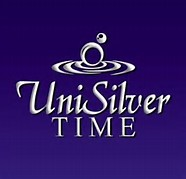 Agree that this is a casting coup – – to be able to put together all three lovely past Ms. Universe winners in one ad. The budget must be really that high for all of them to agree to share the limelight with each other. I kinda feel bad for Pia. Endorsing a chicken after just two years of winning? And it is not even her’s alone. She is sharing it with two equally lovely winners from the past. Way, way past. Parang Smorgasboard. Chopseuy. Di ba? I’m sure she needs all the rakets she can get to pay the bills. 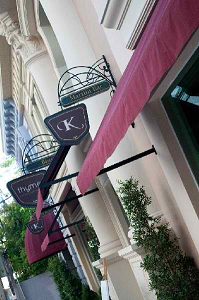 One needs resources to support a a certain lifestyle of a past Ms. Universe winner. Margie came from a well-off family and married well. Gloria came from a well-off family and also married well. Both are grandmothers now and can credibly sell …well…..dressed chickens. Pia… Pia… oh you know the story. “married well” ba talaga yung 2 past misses u?! remember yung feud nina rep. alvarez at floirendo? nag-ugat sa away ng kanilang mga KABIT! and it turned out BADING pala si bong daza(rip)! Priyanka Chopra won Miss W in 2000 and she’s just now making her mark in Hollywood. It’s a slow climb and your exposure will depend on your connections. Pia’s as determined as she is beautiful and I have no doubt she’ll crack the US market in a couple of years. She’ll need to put in some time locally, though, and that’s the hard part if you’re not financially independent. Sige, manok pa ng manok until you save enough money to venture west. Trillanes is the rightful owner of the majestic title “Pambansang Manok” sa senado. Magwawala yan dahil sa kanya lang daw ang crown. IWASAN ANG MGA GANITONG USAPIN, PANGKAGANDAHANG PATIMPALAK ANG PAKSA NG BLOG NA ITO AT HINDI PULITIKA. KUNG ANO MAN ANG HINANAKIT MO AT GALIT SA ISANG PARTIKULR POLITIKO AY SA KANYA MO MISMO SABIHIN ANG IYONG HNAING AT HINDI DITO. Ay manang Angelo sorry po. Wala po akong hinanakit at galit kaninuman. Itoy isang opinyon lamang na pumupukaw sa damdamin ng bawat kagandahang flores sa Pilipinas na may pangarap na makamit ang mga Aces and Queens sa buhay nila na naway maging magandang ehemplo sila sa mga kabataan para sa ikakaunlad hindi lamang sa mga mamamayang pilipino kundi para na rin sa magandang bukas ng ating bansang Pilipinas hihihi 😚 wiz charette. Huwag ka ng maHB salonganisa hihihi. I would like to see Pia follow the path that Margie took. Less in the spotlight but still relevant. Can she host a magazine/travel show instead of acting in movies? 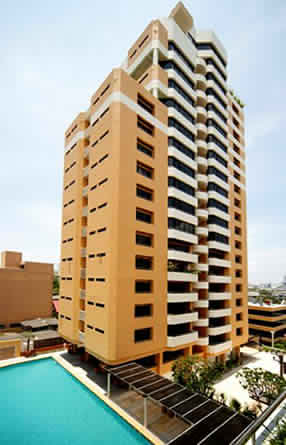 Magnolia is still one of the oldest company in the Philippines. Si Dina Bonnevie nga sosyalera, pero hanggang ngayon pinagmamalaki ang titulo niyang “Miss Magnolia” eh. At may pera ang Magnolia ha, can afford nila kumuha ng 3 Miss Universe sa commercial nila! It’s a far cry from her Hollywood dreams but at least she is working. Don’t you think she should be more selective with her endorsements ? What’s next Pambansang kambing? Kuneho? Baka? Magnolia brand is owned by the San Miguel Corporation, the largest publicly listed food, beverage and packaging company in Southeast Asia as well as the Philippines’ largest corporation in terms of revenue, with over 17,000 employees in over 100 major facilities throughout the Asia-Pacific region. 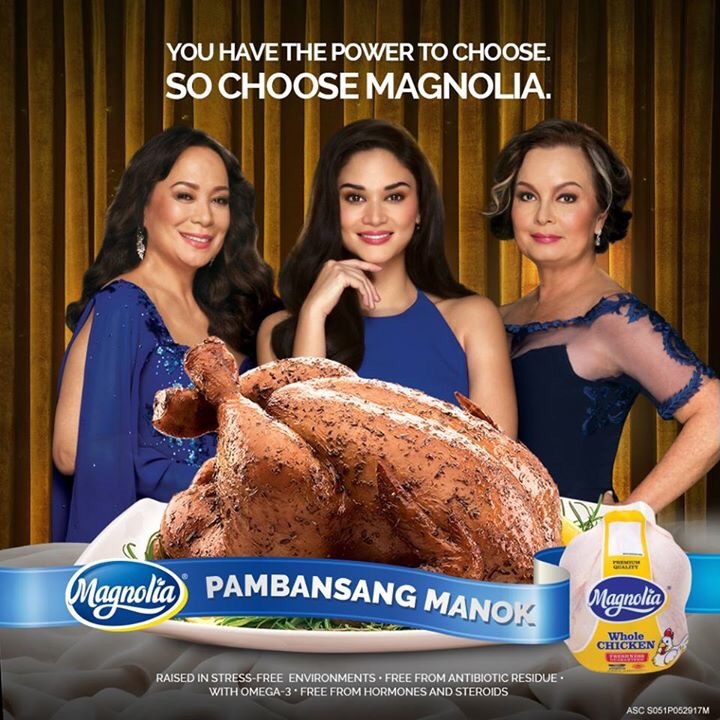 For Gloria Diaz and Margie Moran (Who are both multi-millionaire members of our country’s elite society) to endorse a product as part of a group lead with Pia Wurtzbach… The bussiness giant, SMC most definitely alloted a huge budget for this TVC and majority of this insane amount went to the talent fees of these 3 prestigious ladies. Love it or not because she won Miss U she will be relevant for so long she’ll get endorsements left or right whether its related to beauty or not. As for Hollywood, it will eat her alive… Locally makakasurvive siya kasi nga Miss U she can get roles from time to time pero kung Hollywood she’ll be another Antoinette Taus or Sam Milby na nangarap ng Hollywood pero waley. Gal Gadot had her first Hollywood break in 2009 which is 5years after her reign. Ariadna was lucky that she landed on Hollywood the same year she won as first runner up. Depende rin kasi sa talent agency niya. Hindi ganun kalaki ang mga artist din kasi ng IMG. Kung nasa Creative Artist Agency siya malamang makakuha siya ng mga big roles like Priyanka. Flexible din dapat siya like being able to do action roles which mahirap i-tweak sa current packaging niya. In fact, kahit Yung Manager ni Megan is si Amanda Seyfried Lang and big name na hawak Kaya baka minor roles Lang din ang landing pero we can’t predict then. At the end of the day, it’s still their talent that counts.